Persona is based on an ideology that by categorizing characters into archetypes, you can know their background, which in turn shows their motivations, and then, allows you to predict their behavior. It's the difference between knowing your character and just allowing your character to evolve. To put it more bluntly, it is the difference between deliberately crafting a compelling character and hoping that the character turns out the way you wanted. Packed inside Persona are 32 archetypal themes - good guys and bad guys. These archetypes are described in detail: personality traits, qualities, flaws, background, occupations, and how they interact with other personalities. 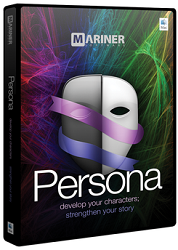 Whether your character is a brainiac talking fish or an outcast orphanage owner, Persona helps you explore how each one's unique psychology and background influences their dealings and dialogue. Choose a name and know its origin and meaning from one of the 16,000 names included in the Names database - or, add your own.